Scottscope: Animated Series Preview: The First Official Image From The Brand New "Thundercats" Series! Animated Series Preview: The First Official Image From The Brand New "Thundercats" Series! 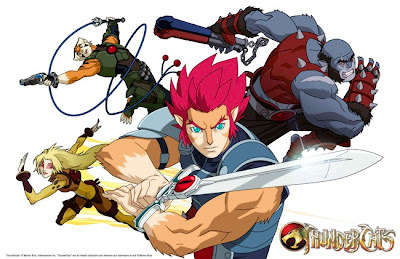 Warner Brothers has just released the first official image from its brand new Thundercats cartoon (shown above). Their new visages offer some perspective as to the direction this series might be taking. Panthro and Lion-O have received the most extensive makeovers. The former looks more like a panther/ape hybrid than a feline humanoid. His frankly huge looking nunchaku resemble two thirds of a three-section staff. His gargantuan size (in comparison to the other three) makes him look more like hired security for the other Thundercats than a teammate. Add scars and male pattern baldness to the mix and you've got a Panthro that looks far more fearsome and battle weathered than the original. The lord of the Thundercats looks considerably younger than his 1980’s incarnation. It is important to remember that Lion-O was literally a young boy with a grown mans body in the original series. Perhaps this new version does away with that convention and simply presents Lion-O as a prince who is being groomed to one day take his rightful place. Tygra and Cheetara merely look like modernized versions of their former selves, complete with armor and weapons. The designs aren’t at all bad, though fans will likely spurn the anime makeover and the younger Lion-O. They seem to forget how poorly their favorite 22 minute serialized/syndicated toy commercials from the 80’s have dated over the years. None of those shows were particularly good, though they did present some cool mythologies and characters. A new take on the material can only result in a vastly superior product than. Before any Thundercats devotees get up in arms over my statements, I implore them to keep in mind that I used tape episodes of the original series on VHS as a child and received a bevy of Thundercats toys as Christmas presents in 1985. I have a deep and lasting affection for this property, but that affection is tempered with realism. I’d love to see old Lion-O wielding the Sword of Omens as he calls his brethren to action, I’d just like it to be featured in something considerably better than what I saw as a child.